Read our Customer Feedback Here. If you would like to leave reviews and comments about our services please send your message using our contact form. We would like to thank everyone who has left recommendations and look forward to hearing feedback from all customers past and present. Wayne has just painted my garage door, kitchen walls and ceiling and applied varnish to the cladding on the front of my house. As always, he has done a fantastic job. Always clean and tidy. I can't recommend him highly enough. A truly talented decorator. Thank you. Wayne Atkin decorated my open plan kitchen, dining room and living room, hanging wallpaper in the lounge and dining areas. He also repaired and replaced some coving making a wonderful job of that. 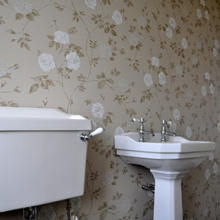 The wallpaper hanging has been done to perfection with skill and attention to detail. Even a former Decorator said he had never seen paper hanging done so well. I am delighted with the work and could not be more pleased. I cannot recommend Wayne highly enough. Hi Wayne, many thanks for doing my decorating so well and efficiently. It is the best job that we have had done and we have had a few. It is excellent and we are very pleased. From Margaret H. A happy customer. 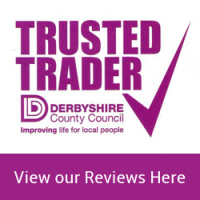 We have never written a review on anything we have bought or used before but we felt we had to put something on Wayne's website. We contacted Wayne on spec as we had been let down by our decorator and only had a few weeks before we had to move in. Wayne came out the same day, gave us a quote there and then and an expected time scale. Wayne turned up as arranged and just got on with the job. He completed the job as he had quoted and even fitted the 'Road-Runner' image for the kids. We have recommended Wayne to anyone that has asked about decorators and even people that haven't. We want to thank you for an extremely high quality job and wish you all the best for the future. 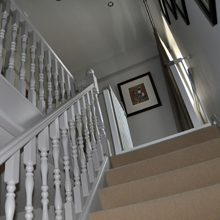 We will be in touch when we next need an excellent reliable decorator. Thanks again. Wayne has worked for us on numerous occasions, previously while he was employed by Gazzards and recently after starting to work for himself. He decorated almost the whole of our last house and has just spent 3 weeks at our new address re-decorating the day room, dining hall, staircase and landing. He has never failed to do a first class job of which we have been delighted. He is very tidy and take the utmost care to protect furniture and fittings. He is reliable, trustworthy and courteous and we hope he will be back sometime this year to complete another project for us. Just wanted to comment on how professional you were and how much you got done in a day! Really pleased with the work you did for me and I'll see you again in a couple of weeks! Brilliant job, neat and tidy, very professional. Very happy with the work completed and would happily invite Wayne back again. Wayne is very easy to have working in the house, easy to get along with and flexible. Thank you. I would like to recommend Wayne Atkin, Decorator, for giving an excellent service in decorating my house. 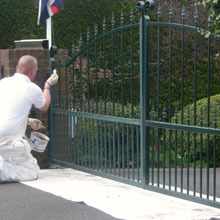 He is very thorough in his preparation and the finished job was first class. I have no hesitation in recommending him as a decorator of the highest standard but with a very realistic scale of charges.